Immigrant arrivals to the United States and the makeup of the foreign-born population have been changing in significant ways: Recent immigrants are more likely to be from Asia than from Mexico and the overall immigrant population is growing at a slower rate than before the 2008-09 recession. This useful article collects in one place some of the most sought-after statistics on immigrants in the United States. The United States has long been the top choice for international students from around the world, hosting about 1.1 million foreign students in higher education institutions in 2016-17. However, U.S. enrollment has slowed in recent years due to several factors. This article offers a data snapshot of the population of international students in the United States. After receiving more than 2 million asylum seekers in 2015-16, European countries are turning to the task of integrating the newcomers, including getting refugees into work. This article explores labor market integration of refugees in five Northern European countries—Denmark, Germany, the Netherlands, Norway, and Sweden—drawing key lessons for today from the experiences of earlier groups of humanitarian arrivals. More than 1 million international students were in the United States in 2015-16, a significant share of them in science, technology, engineering, or math (STEM) fields. While countries increasingly are vying for this population, these individuals face a complex choice upon graduation: to stay or leave? This article examines international STEM students in the United States and the motivations underlying their postgraduation plans. While Mexican women account for a significant share of migration flows to the United States, there has been little focus on their movement and effects on children in Mexico. This article, based on survey data of children in Puebla, Mexico, explores the impact of maternal Mexican migration on educational experiences and aspirations of the children left behind. Although the number of U.S. residents who speak a language other than English has grown in recent decades, the share of those who are Limited English Proficient (LEP) has fallen: 40 percent in 2015, compared to 44 percent in 1980—even as immigration rose rapidly. This article examines growing linguistic diversity in the country and sketches a profile of the LEP population, including size, location, and socioeconomic characteristics. The Head Start program—a model for early childhood education programs nationwide—has served more than 33 million children since its inception half a century ago, many from immigrant families. This article examines the role of Head Start in the education of Dual Language Learners, who now comprise one-third of enrollees, and discusses how recent policy changes may affect this population. The number of international students enrolled in U.S. colleges and universities has risen steadily since the mid-20th century. Today, the United States represents the top destination for international students worldwide. Learn more about where these students come from, which universities they attend, and the subjects they study in this Spotlight article. Get all the latest and historical facts and figures on immigrants and immigration in the United States in this handy resource. With immigration often surfacing in public and political debates, learn the answers to such questions as: How do current immigration flows compare to earlier ones? How many unauthorized immigrants live in the United States? 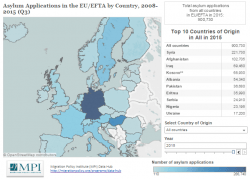 How many refugees are admitted annually? And get answers to many more questions. The number of college-educated immigrants in the United States has more than tripled in the last two decades. Asians accounted for 46 percent of the 10.5 million college-educated immigrants, with India the top origin country. This Spotlight article examines key indicators of the college-educated population, including international students and high-skilled H-1B visa holders. The emigration of health-care professionals from Malawi led to drastic labor shortages in the impoverished nation in the early 2000s. To combat this brain drain, the government launched an action plan that has largely stabilized the outflow. However, human resource challenges to Malawi's health-care system remain acute and complex, as discussed in this feature article. This article explores differences in application and renewal rates for the Deferred Action for Childhood Arrivals program among unauthorized immigrants from Latin America and Asia. Based on interviews with immigrant advocates and service providers, it appears participation in the deportation relief program may be different among origin groups based on varying perceptions of lack of trust in government and shame over legal status, as well as political barriers. Public frustration with decades of poor governance and pervasive corruption in Ukraine culminated in the EuroMaidan revolution in November 2013. Since then, violent conflict and Russia's annexation of Crimea have displaced an estimated 2 million people, both internally and internationally. This feature article explores migration ambitions among Ukrainians in the lead-up and aftermath of EuroMaidan, and the impact of war and economic crisis on traditional migration patterns. In 2013, more than 25 million people in the United States reported limited English proficiency (LEP), an 80 percent increase since 1990. The LEP population, the majority of which is immigrant, is generally less educated and more likely to live in poverty than the English-proficient population. This Spotlight explores key indicators of the LEP population, both U.S. and foreign born, including geographic distribution, language diversity, and employment. With rising inflows of humanitarian and economic migrants, Norway faces a series of integration challenges. In conversation with the Migration Information Source, Solveig Horne, Norway's Minister of Children, Equality, and Social Inclusion discusses her work on integration policy, from the importance of language training and a feeling of belonging, to the protection of immigrant women and resettlement of asylum seekers. An estimated 41.3 million immigrants lived in the United States in 2013, about 13 percent of the total U.S. population, constituting the world's largest foreign-born population. This Spotlight from MPI's Jie Zong and Jeanne Batalova offers the most current and sought-after data on immigrants in the United States—including origin, educational attainment, the unauthorized, deportations, and more—in one easy-to-use resource. In Moldova, 100,000 children have been left behind by migrant parents; in Ukraine, there are 200,000 such children. The scale of labor migration and impact of remittances on both economies have prompted Moldova and Ukraine to work with the European Union and international organizations to develop policies addressing the welfare of left-behind children. This article examines research on the effects of parental migration on children and the policy environment. The U.S. immigrant population—estimated at 40.8 million in 2012 — is the nation’s historical numerical high, and it is also the largest foreign-born population in the world. About 20 percent of all international migrants reside in the United States, even as the country accounts for less than 5 percent of global population. This article presents the latest, most sought-after data on immigrants in the United States—by origin, residence, legal status, deportations, languages spoken, and more—in one easy-to-use resource.